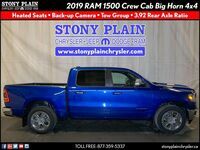 The 2019 version of the RAM 1500 is tasked with holding up the impressive reputation previous versions of the pickup truck have established. The latest version of the RAM 1500 is up for the task. 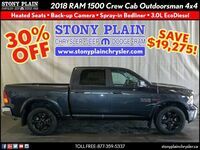 The 2019 RAM 1500 in Stony Plain AB continues to provide the performance and features car shoppers expect from the impressive truck. 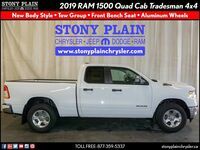 Two engine options are available on the 2019 RAM 1500. Standard equipment includes a 3.6-liter V-6 engine. This engine produces 305 horsepower and 269 pound-feet of torque. 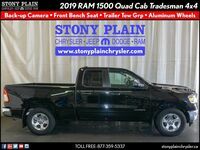 In addition to the base engine, the 2019 RAM 1500 offers a 5.7-liter V-8 engine rated at 395 horsepower and 410 pound-feet of torque. The 2019 RAM 1500 will be offered in seven trim levels. The truck is available in Tradesman, Big Horn, Sport, Rebel, Laramie, Laramie Longhorn and Limited models. Each trim level offers a variety of features and technology systems. 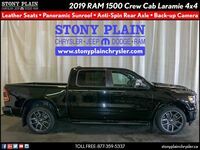 The RAM 1500 can be equipped with all the top technology features RAM has to offer, including the new 12-inch Uconnect touchscreen infotainment system. 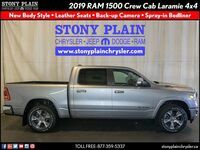 Comfort and Technology Features:Automatic headlights, Bluetooth, USB and auxiliary connectivity, satellite radio, Android Auto and Apple CarPlay, heated and ventilated seats, heated steering wheel, keyless entry. Safety and Driver Assistance Features: Rearview camera, emergency notifications, blind-spot monitoring, rear cross-traffic alert, adaptive cruise control, forward collision warning, automatic emergency braking, lane departure warning and a surround-view camera system. 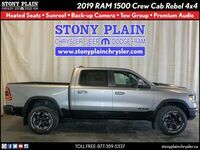 The Rebel trim level of the 2019 RAM 1500 adds multiple features designed to maximize the off-road performance of the truck. Rebel models add off-road tires, front tow hooks, skid plates, special shocks and suspension, electronic-locking rear axles and hill descent assist.